Ernest "Nellie" Nelson, Chief Boatswain's Mate, born Sept. 22, 1920, Prince Albert Canada. 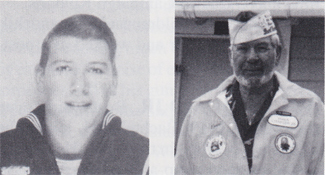 He joined the USN Oct. 12, 1937, and went to boot camp at Great Lakes, IL. Reported aboard USS California in February 1938 (his brother was aboard). After the ship sank on Dec. 7, 1941, he was ordered to Receiving Station at Pearl Harbor; set-up Navy 5-25 AA guns at Hickam Field and he trained five companies of soldiers to take over guns. Instead of new construction they were ordered to the USS West Virginia to the nasty dirty job of remodernizing, but it was well worth it. After that, they joined the fleet and were soon underway to Leyte, Surigao Strait Battle, Lingayen, Iwo Jima and Okinawa. They were the lead ship to cross the "T" Surigao Straits (an admiral's dream). They were credited for sinking a Japanese battleship and more. She was one fighting lady! They put ship out of commission out at Bremerton, WA, in 1947. Nelson retired in 1957. He joined operating engineers for 23 years, retired and now fishes in Stockton, CA.